Paul Haxby is a driving force behind the concept of powered flying with a passion for flight and the director of AXB. 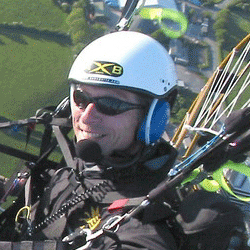 Paul has been flying since 1991 and started flying paramotors in 1998. 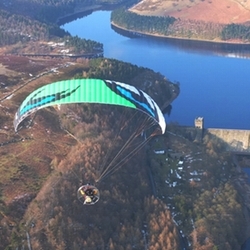 Since the legalization of powered foot launch aircraft in the U.K., he has concentrated most of his efforts into testing paragliders, paramotors, teaching and supplying reliable flying equipment. He has completed cross country flights that have been featured in the national flying magazines, which is proof that the equipment is tried and tested and capable of providing fantastic flying flying experiences. 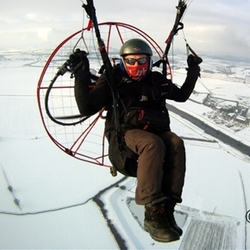 After developing and manufacturing the successful AXB Hawk paramotor, he is now concentrating on his work with Apco Aviation while continuing to provide flight training and equipment. Paramotoring is a type of ultralight aviation and uses a paraglider wing made of a nylon type material to create lift. The pilot hangs from the paraglider wing via strong dyneema or kevlar lines, in a comfortable harness with the 2-stroke petrol motor and propeller fixed on the back. The thrust from the propeller is directed out behind the pilot and provides forward momentum in order to takeoff and fly. The paraglider is controlled by "brakes" which are control lines that act like flaps on an aeroplane wing. One brake for each side of the wing, pulling the left brake turns the wing to the left and vice versa. The thrust of the motor is controlled by a throttle that looks and operates similar to a bicycle brake handle. Squeezing this throttle increases the engine revs and so thrust increases. Although paramotoring is a risk sport, the risks can be minimised with good training and equipment, many UK paramotor pilots have achieved hundreds of hours of flying without accidents or injuries. It can be learnt in little time compared to other forms of aviation training such as the PPL. You must be reasonably fit and capable of carrying a weight on your back. Hand-eye coordination is key to groundhandling (the main part of training) but this comes with practice. As far as cost goes, paramotoring is one of, if not, the cheapest form of powered flight. New paramotor units can cost anywhere between £2500 and £6500 and new paraglider wings, £1700 to £2500. Of course there is a second-hand market with some good deals to be had which may cut the cost. After training, all you are paying for is the petrol and oil plus general maintenance costs. Another advantage of paramotoring is that it is so portable. You can stick everything you need into the boot of your car, drive to your local takeoff area and if the weather's good, be in the air in a matter of minutes. This is a fantastic way of achieving flight when microlighting, light aircraft, sailplanes etc are too much of a commitment and a strain on your finances. To find out more about paramotoring, click here.